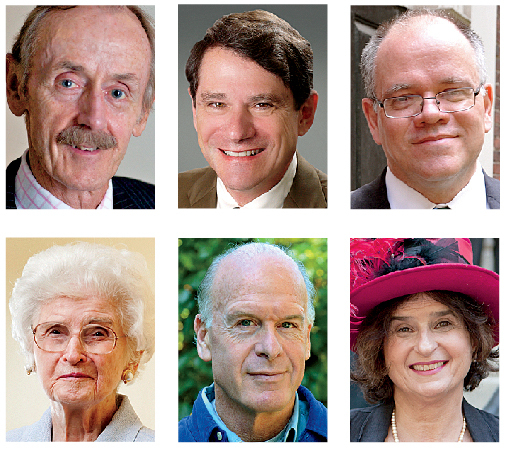 Six alumni received the Harvard Alumni Association (HAA) Awards—for their outstanding service to alumni activities for the University—during the fall meeting of the HAA’s board of directors. Thomas E. “Ted” Blamey, M.B.A. ’70, of Sydney, Australia, is a “life member” of the Harvard Club of Australia and received its Legends Award in 2011 for contributions that include chairing its nonprofits program from 2001 to 2015 and helping establish fellowships for the Harvard Business School (HBS) course “Strategic Perspectives in Nonprofit Management.” Blamey also initiated the revitalization of the nearby Harvard Club of Victoria in 1998, and has been instrumental in coordinating the annual Krokodiloes tour in Sydney for well over 20 years. Peter A. Carfagna ’75, J.D. ’79, of Shaker Heights, Ohio, has been a member of the Harvard Club of Cleveland’s schools and scholarships committee since 1979, served as a senior class marshal, been active in the quinquennial reunion-gift committees through the Harvard College Fund, and in 2002 became an elected director of the HAA. The former president of the Harvard Law School Association of Cleveland has also been a visiting lecturer in sports law at the school and faculty adviser to the Sports Law Clinical Placement Program since 2006. Joan Keenan ’45, HRP ’47, of Lexington, Massachusetts, worked on behalf of Radcliffe for decades, including as a trustee from 1974 to 1980, a class and reunion chair (most recently for her seventieth), and as an officer of the Alumnae and Friends of Radcliffe College. Her contributions, benefiting both the College and the Radcliffe Institute for Advanced Study, earned her the Radcliffe Distinguished Service Award in 1995 and the Radcliffe Institute Apple Tree Award in 2005. Keenan is also a 50-year member and former vice president of the Harvard Club of Boston and a past officer and member of the HBS Club of Boston. Robert M. Kraft ’76, of Encino, California, has co-chaired the Harvard Office for the Arts’ advisory committee and been a member of the Faculty of Arts and Sciences Arts Resource Council, the Harvard clubs of New York and Southern California, and Harvardwood. A panelist for the “Harvard in Hollywood” Alumni College in 2005, he has also lectured on film music and participated in workshops with student composers. In 2008 he became an HAA elected director. Nancy Sinsabaugh ’76, M.B.A. ’78, of Cambridge, serves as class treasurer (she has been an executive committee member of the Association of Harvard College Class Secretaries and Treasurers) and has chaired several reunions (including those of her HBS class). A member or former member of Harvard and HBS clubs in France, Luxembourg, Minnesota, New York, and Boston, Sinsabaugh was also an alumni interviewer from 1994 to 2005. As a veteran of the HAA’s Happy Observance of Commencement Committee, she designed the hats now worn by its women members and provides televised commentary for the Annual Meeting of the HAA. Her roles on the HAA’s board of directors have included treasurer and chair of the classes and reunion committee.